I am not naturally a morning person so my mom use to come in our rooms bright and early, when the birds are singing, clapping her hands and singing loudly, “Rise and shine, and give God the glory, glory, children of the Lord!” I was not good at getting up at my alarm either so my dad would come in to make sure I was awake. My childhood memories stirred my interest in researching the actual lyrics to the hymn, “We will Rise & Shine.” I found that my own interpretation of the song in my life was much different from the meaning of the words written in the original hymn. I grew up thinking the “Rise & Shine” chorus was a very happy, upbeat, get out of bed, good morning, praise God kind of song. But, the actual lyrics make more reference to being a strong “soldier of the cross” by climbing Jacob’s Ladder, reaching higher, and trusting God in order be cleansed, receive blessings, and have glory through Jesus’s death on the cross. The actual words gave me a new perspective of my interpretation of the lyrics so I decided to combine my childhood interpretation along with the new meaning from the original classic. I have also been highly influenced and inspired by Mandisa’s “Good Morning” song. The “Good Morning” song is a new version of a great way to wake up singing and praising God. This specific song really makes me happy and gets me energized in a positive way to start my day. I am still not a natural morning person, but the combination of these songs and my experiences help me try to rise, shine, focus on God, and give Him the glory so His light can shine in me (even in the morning). The sunrise is placed at the very top, center of the canvas to represent God and His light, power, presence, and glory that radiates into our lives. The water flowing down into the birdbath symbolizes the blessings that God washes down into our lives constantly. The lineup of birds is actually a poster of the painting called “The Bird Perch” by Hector Giacomelli (French, 1822-1904) that hangs in the Ryerson Library Collection at The Art Institute of Chicago. I collaged this poster into the piece since it was a gift from my mom because my kitchen is decorated with a “Chirp/Bird” theme. Mornings just aren’t the same if the bird’s aren’t singing. All the birds placed along the top represent all the special people that have watched over me and helped me in my life. 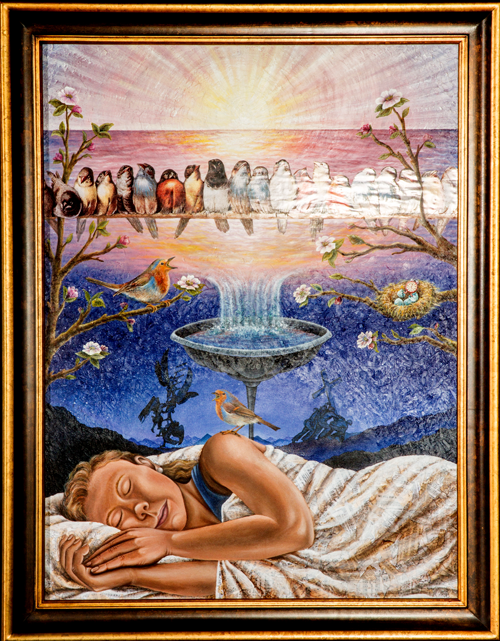 The bottom includes a self-portrait with me sleeping peacefully and dreaming, right before I wake up to the sunrise and the bird’s singing. 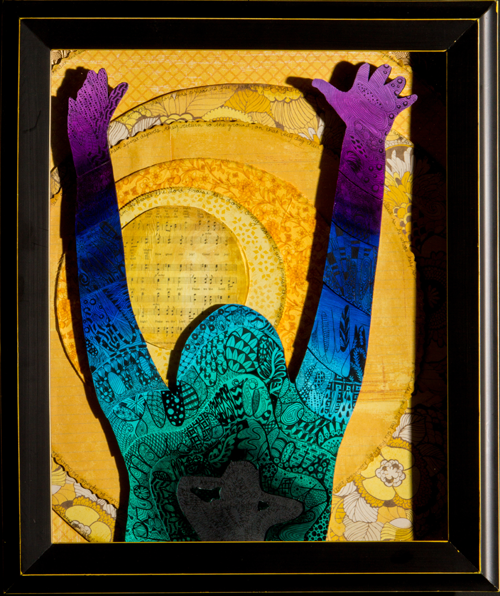 The sheet and pillow is made from the collaged hymn music of “We will Rise and Shine.” The bird on my shoulder represents my mother as she came in singing to us in the mornings as little girls. The mountainous horizon line represents the dream world that includes the iconic image of the sculpture of the soldiers “Raising the Flag on Iwo Jima,” but I replaced it with a cross since we are “soldiers of the cross.” The other image is taken from the sculpture “Jacob’s Dream” created by my college art professor Jack Maxwell and is located on the ACU campus grounds. I love this sculpture and it allows me to add another personal element from my past experiences into the piece as it captures the image of Jacob’s ladder in the song. There are tree branches of apple blossoms coming into the composition from both the left and right sides of the canvas. The bird perched in the branches on the left represents my dad watching and overseeing the family each new day. The nest placed in the branches on the right with 3 eggs representing my 2 sisters and me (3 girls). One egg is hatching an alarm clock as my wake up call I always try to ignore. And I can feel the hope that’s rising up in me. I’ll give you the gospel of St. John. I can feel the hope that’s rising up in me.